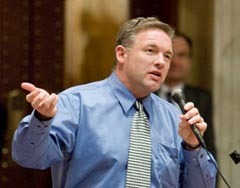 Assembly Speaker Mike Sheridan (D-Janesville) has formed the Speakers Task Force on Preventing Home Foreclosures (STOP). "Since the beginning of the year, 5,700 Wisconsin families have the seen their homes go into foreclosure that&apos;s 70 foreclosures a day," says Sheridan. The Janesville Democrat says the panel is made up of community advocates, bankers, as well as legal and real estate consultants. The goals are to identify solutions to the foreclosure crisis and make legislative recommendations. Assembly Majority Leader Thomas Nelson (D-Kaukana) says foreclosures mean more than dollars and cents. He calls is not just an economic issue but a family values issue. Bob Jones, Public Policy Director for the Wisconsin Community Action Program Association, says homeowners are not the only ones in danger but renters may be out on the street as their landlords property is foreclosed upon. State Representative Leon Young (D-Milwaukee) will chair the bi-partisan task force which is planning public hearings in Western Wisconsin, Milwaukee and the Fox Valley, areas that among the hardest hit by foreclosures.